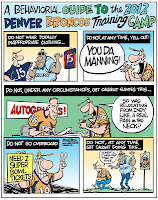 On Monday, the Denver Broncos announced their 2013 training camp schedule. Players will return to the team's Dove Valley complex on July 24 and practices will begin the next day, on Thursday, July 25. The schedule includes fifteen practices that will be free and open to the public, including a team scrimmage at Sports Authority Field at Mile High on Saturday, August 3. Please note that the dates and times of the practices are subject to change, see @DenverBroncos on Twitter the day of practice for the latest updates. View the team's full training camp schedule after the jump. Thursday, July 25 8:50-11:30 a.m.
Friday, July 26 10:25 a.m.-1:05 p.m.
Saturday, July 27 8:50-11:30 a.m.
Sunday, July 28 10:25 a.m.-1:05 p.m.
Monday, July 29 8:50-11:30 a.m.
Wednesday, July 31 10:25 a.m.-1:05 p.m.
Thursday, August 1 8:50-11:30 a.m.
Friday, August 2 10:25 a.m.-1:05 p.m.
Saturday, August 3 5-9 p.m.
Monday, August 5 10:25 a.m.-1:05 p.m.
Tuesday, August 6 8:50-11:30 a.m.
Saturday, August 10 8:50-11:30 a.m.
Monday, August 12 10:25 a.m.-1:05 p.m.
Tuesday, August 13 8:50-11:30 a.m.
Wednesday, August 14 10:25 a.m.-1:05 p.m.
Thursday, August 15 8:50-11:30 a.m.
Click here to see the team's 2013 regular season schedule.